If you are looking for a simple and classy way to incorporate an African tradition into your birthday or wedding day, this is a great place to start. Oto is a hearty and tasty Ghanaian dish that is quite easy to learn to prepare. I recently celebrated my birthday, and so in true Ghana style I asked one of the women on our compound to teach me how to make traditional oto. Oto is boiled mashed Ghanaian yam mixed with some kind of onion-infused lipid. The Ga people of Accra tend to serve it mixed with onion-infused palm oil, which gives it a bright saffron coloring and a distinctive West-African taste. I have had it served mixed with margarine instead of palm oil by a Fanti family in Cape Coast, although I do not know how widespread this practice is. The Ga people take oto as a traditional breakfast on their birthday. You are expected to make a large bowl of oto and then invite your family, neighbors or friends to come and join you in the morning for your birthday breakfast. Eggs are rich in symbolism in traditional Ghanaian cultures. They are an integral part of female puberty ceremonies, where the egg is used to symbolize fertility and the transition to adulthood. Because early missionaries strongly opposed these puberty ceremonies, these ceremonies have mostly died out of practice now. However, egg still remains of symbolic and practical value. In addition to lingering symbolism about fertility, as well as several saying about the delicacy of holding power, eggs are a favored source of protein. My Ga friend explained to me that back when times were hard, families rarely had meat or protein, so it was an honor for a child to receive an entire egg for his or her birthday. Oto is also the favorite breakfast of brides on their wedding day. However, this practice was explained to me as an entirely practical, rather than traditional or symbolic, consideration. Because of the starchy nature of the boiled yam, brides and their attendants eat oto on the morning of the wedding so they can stand up through the long ceremony without having to feel the call of nature. Last month while attending the wedding of a woman I have known for eight years, all of us who were at her house helping her get ready, from the hair stylist to the make-up technician on down, all took a small bowl of oto to start the day. What is Ghanaian yam? Yam in Ghana is not the bright orange tuber Americans associate with Thanksgiving. It is a large tuber with rough external skin like tree bark and a hard pale white interior. My friends here tell me there are at least six different varieties of yam sold in the markets here, but the most highly prized yam is the sweet, soft yam known by its local name. 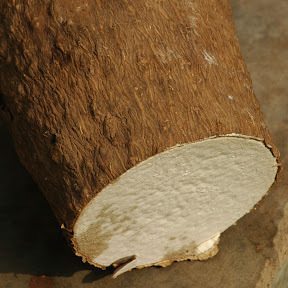 Another variety, known in English as water yam, is more widely available and less expensive. *Boiled yam can be found at African specialty stores. I know that the Rogers Park Fruit Market on Clark carries them. You can usually also find Ghanaian yam at the African grocer “Makola” on Wilson Street. I am sure that Washington DC, New York, Atlanta, and Houston also have African grocers. If you need to substitute, a dry baked potato has roughly the same consistency as a boiled Ghanaian yam. Try about 6 large Russet potatoes to substitute for one Ghanaian yam. Peel the yam and cut it into 1-2” cubes. Wash the cubes well, and discard the washing water. Add yams to a pot of water and salt well with sea salt. Boil yams until tender approximately 20 minutes. Remove from heat and drain. Mash with a pestle, potato masher, or food processor. Cut one of the onions into quarters. Add the quartered onion to the palm oil. Heat oil to a boil, but not so hot that the oil sputters and jumps out of the pot. Fry the onion like this until the onions puff and float to the top. Using a slotted spoon, strain the quartered onions out and discard. Cut the other two onions into small dice. Add the diced onions to the boiling oil. Cook, stirring continuously and scraping the bottom so they do not burn to the pot. Cook for approximately 5-10 minutes or until the onions are well cooked and caramelized. Add the dried powdered shrimp to the oil and stir to combine. 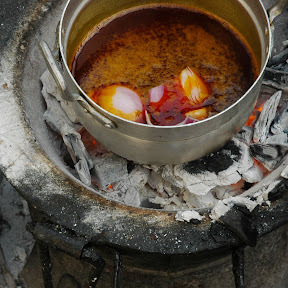 When the onions are well cooked and fragrant, remove the oil from the fire. Using a slotted spoon, begin to add some of the oil and onion mixture to the mashed yam, mashing and grinding to incorporate before adding more. You will use all of the cooked onion but you will probably not use all of the oil. 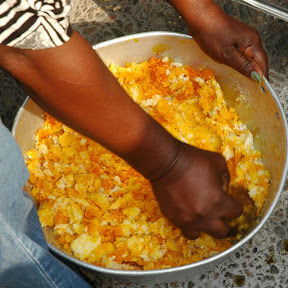 Continue adding oil and mixing to incorporate until the yam is an even saffron color. Taste. Add oil to your taste. If the dish is not salty enough to you, add salt first to the remaining hot oil, stir to incorporate it, and then add the salted oil to the yam. This dish is always served with boiled eggs. 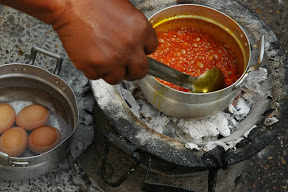 Here people add the eggs on top of the yam cubes when they first cook the yam. If you prefer to control the cooking of your eggs separately, feel free to boil the eggs however you are accustomed to boiling them. Serve each individual portion of oto with a whole or half boiled egg. How is it served? You can always serve it in individual bowls with a spoon. Plenty of people here eat it that way too. But if you are looking for a more traditional or authentic experience, eat the oto with your hands out of a large communal bowl. If you want to eat this way, you should put out a large bowl of water and soap at the table so everyone can wash their hands first. Also, you only eat with your right hand, never your left. You right hand is considered your “clean” hand and your left hand your “dirty” hand, and so never to be used with food, especially not when eating communally. The yam is very pliable, so you can reach into the bowl, take a small amount, press it into a ball in your palm, and then eat it. 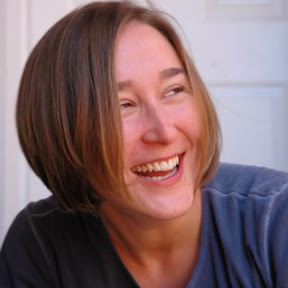 I am submitting this post to Swirling Notions for Weekend Herb Blogging. What a fascinating entry, Erin! And what a fascinating life you lead! Great post! I have heard about the yams of Africa, but never was very sure what they would be like. It's so interesting learning about the traditions associated with the food too. It sounds like you're having a great adventure there. oh wow ghanaian food! my dad went to ghana while he was in the peace corps...I heard lots of amazing stories! Nobody ever tries to make ghanaian food..."ethnic" is usually indian, moroccan, greek, thai, etc. Thanks for doing something different! Glad you found it interesting. I have really been trying to hone my Ghanaian cooking stills and translate the loose cooking style into recipes that others could follow. I hope to present more Ghanaian dishes in the weeks that follow. After I return I even have a thought that I might take on the challenge of African fusion, creating some haute cuisine based on Ghanaian cooking principles and taste combinations. As for a fascinating life, I was just talking to my husband about that. The funny thing is that after coming here so much it just seems "regular" after a while, like going to a second home. But coming here has taught me the value of going outside my comfort zone. Now that I have become comfortable in Ghana, I am hoping soon I will find a new adventure to stretch my horizons. I swear ... no one can say it better. You have brought Ghanaian food into the limelight. That's really interesting and looks great. I realized that I don't think I've ever had anything close to Ghanaian food before, but I'd certainly like to now!